This installment of the CLASSifieds-series clocks in at 14 pages, 1 page front cover, 1 page editorial, 1 page ToC, 1 page SRD, 1 page back cover, leaving us with 9 pages of content, so let’s take a look! 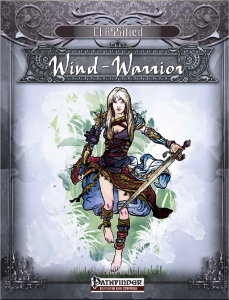 The wind-warrior class presented herein gains d10 HD, 4 + Int skills per level, full BAB-progression, good Ref- and Will-saves as well as proficiency with simple weapons, one-handed martial weapons, light armor as well as katana, naginata and wakizashi. Starting at 1st level, the wind-warrior may use Dexterity instead of Strength modifier with one-handed weapons capable of dealing slashing damage (oddly locking out the naginata -making me think it may have been a leftover from a previous iteration) with the Way of the leaf ability. Starting at 3rd level, the ability is upgraded to provide Dex to damage instead of Str-mod as well. Starting at 5th level, using way of the leaf provides a visible wind-effect that nets +1 to atk and damage while using Way of the Leaf, which increases by +1 every 4 levels thereafter. At 18th level, the critical multiplier of weapons used in conjunction with way of the leaf increases by 1. 2nd level provides an interesting ability that is pretty important for the class – a flurry of sorts, which comes with the standard -2 penalty and stacks with haste – all in all, solid in wording etc. However, 2nd level provides a more important ability, namely boundless step: When making a full attack and successfully striking the enemy, the wind-warrior may take a 5-foot-step. Kudos: it gets the interaction with the regular 5-foot-step right and even the action economy. The movement has to remain in the threatened area of the target and movement provides a stacking dodge bonus for such movement, which plays more interesting than it looks on paper. Starting at 7th level, this ability allows for the ignoring of difficult terrain and at 10th level, things become interesting, making these steps 10-foot steps that count as two steps each. The ability also has a cap per round – while the wording is missing a “times” in the ½ class level times per round cap, that is a cosmetic oversight. On the defensive side of things, the class gains uncanny dodge at 4th level, improved uncanny dodge at 8th, evasion at 12th and improved evasion at 16th level. 2nd level and every 3 levels thereafter yields a bonus feat. 6th level provides gust of wind as a SP, usable 3 + Wisdom modifier times per day and 8th level provides an immediate action wind wall SP, also governed by Wisdom. 15th level provides the option to assault foes with 8d8 slashing cones Wisdom modifier times per day and 19th level provides constant freedom of movement. The capstone lets the class execute a full-attack as a standard action…and even after a charge. OUCH! The pdf comes with favored class options for the core races and a couple of others, though oddly, the skills and saves here are not properly formatted, being lower case and lacking brackets in e.g. references to Knowledge (nature). The FCOs themselves are solid. The pdf also contains a couple of archetypes: The windwalker would be a monk-like version of the class, who modifies the proficiencies and instead increases the benefits from boundless steps. Instead of the way of the leaf upgrade, we have the option to, as a full-round action, move twice movement rate, including movement over water, lava and on surfaces that wouldn’t carry the character’s weight. 5th level provides a scaling shield bonus that increases every 4 levels thereafter. 6th level and every 5 levels thereafter upgrades as what the unarmed strikes as treated for the purpose of overcoming DR as part of an attack, usable a limited amount of times per day. 15th level yields a properly codified control winds. Really cool: At 18th level, after moving twice via the boundless step variant of the archetype, you may execute an attack that can send the target flying. Nice one. The Bladewalker is basically the TWF-version of the class, losing some of the more supernatural tricks of the base class, with a decreased boundless step potency due to the increased attack array. Finally, the windbender would be the 2-handed weapon specialist, who may take penalties to attack CMB in favor of damage-increase, thankfully not stacking with Power Attack etc. (the feat-reference is not capitalized properly, as a nitpick). Other than that, basically a two-hand weapon iteration of the class. Editing and formatting are very good on a rules-language level and the few glitches I noticed on a formal level do not impede the ability to understand the material. Layout adheres the neat 2-column full-color standard of the series and the pdf provides some nice pieces of full-color artwork. The pdf comes fully bookmarked for your convenience. Nice! I wasn’t excited for Andrew Campbell’s class at first – however, the wind-warrior has some serious raison d’être: The class is flexible and allows you to play a skirmisher martial and rewards smart use of the stepping-tricks. The rules-language of the abilities, which is more difficult than you’d think at first, it really solid, so nice job. Balance-wise, the wind-warrior should not pose a problem for any table: The class is well-balanced and I can see it working in an otherwise magic-lless WuXia-setting even – so yeah, very easy to integrate into an ongoing campaign. While there are a precious few formatting glitches, that is not really enough to compromise the pdf. From a design-aesthetic point of view, I would have liked to see more unique class abilities, but the number of bonus feats provides sufficient customization options. First level is a bit bland, though. Anyways, that is me complaining at a high level – this class is very much worth checking out and hence, my final verdict will clock in at 4.5 stars, rounded down – this is a good, worthwhile addition to the roster of classes. You can get this nice skirmishing class here on OBS!